The veterinary profession is currently suffering the effects of decades of decisions based on unexamined beliefs and subjective surveys rather than objective, statistically valid evidence. With respect to workforce needs and career opportunities, we are operating in the dark. There are signs of potential improvement, most notably the 2013 AVMA-IHS Veterinary Workforce Study . We must improve qualitatively, though, if we are to better the economic condition of our profession- which we must do to maintain the quality of service we provide to society. As professionals we do best when we make evidence based decisions. The same holds true for us as a profession as well. Gender disparity is one issue the profession is unable to address due to a lack of evidence.2 Another is supply and demand. Do we have an oversupply? Underdemand? How about a worst case combination of the two? Do we have a shortage of veterinarians? To fully appreciate the answer to this question, and how we've arrived at the answer, we must move in chronologic order. In the first example, the fact that half of all counties in California had fewer veterinarians than the average number of veterinarians per county in California is interpreted as half of all counties having a shortage of veterinarians and therefore being underserved. Half the values in a dataset being below average better fits the criteria of normal distribution than of a shortage. It could, in fact, be taken as de facto evidence of lack of demand for veterinary services in those areas, indicating the need to decrease production of graduate DVMs. This is the exact opposite of the interpretation used to justify policy decisions that instead increased the number of veterinarians. In the second example, a decrease in hours worked per veterinarian is used as evidence of shortage of veterinarians. What is more likely is that there was a shortage of work to be done in those hours or a shortage of money to pay veterinarians to work those hours. Again, however, an interpretation favorable toward creating more veterinarians was used. Concluding there weren't enough veterinarians to provide care because half of all pets receive no veterinary care is like concluding there aren't enough jewelers because half of us don't have diamond rings. In the third example, the study concluded that there weren't enough veterinarians to provide care because half of all pets receive no veterinary care. That is like concluding there aren't enough jewelers to provide diamond rings because half of us don't have diamond rings on our fingers. The steady increase in class size has resulted in a tsunami of new trainees entering the market. Recently, schools have expanded by 16%, 33%, even 71%. Total enrollment in US programs is up 9% over the past four years.12 No data have been released regarding enrollment at veterinary schools outside the US, not even by those institutions which are AAVMC members13 despite the fact that accreditation of such programs has been a source of bitter discord within the profession for the past two years. "Market indicators suggest excess capacity at the national level to supply veterinary services. 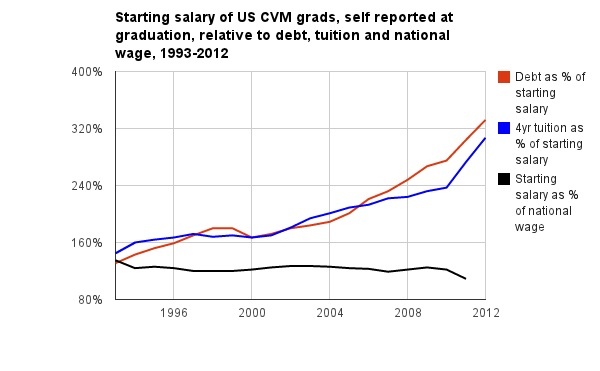 Recent trends include falling incomes of veterinarians, falling rates of productivity (using various measures), and increased difficulty for new graduates to find employment." We submit that this has been an observable trend and that its impact over time is undeniable- the job market is changing dramatically. We reject the notion of overcapacity and underutilization, however, as this implies the market should meet the supply rather than the other way around. Take, for example, an imaginary scenario where the authors wave their magic wand and instantly create 90,000 butchers. Leaving the issue of beef, poultry and pork supplies aside, imagine then that after one year the authors complained that not enough of the American public was adequately utilizing the services of the additional butchers and lamented the fact that the butchers in business prior to the creation of the additional 90,000 butchers had seen a decline in utilization. There is little doubt that intelligent minds would focus on the oversupply of butchers. If the authors then claimed before these intelligent minds that there was not, in fact, an oversupply of butchers, but rather an underutilization of butchers on the part of the American public, the authors would be dismissed as crazy. We would never even get the chance to suggest a marketing campaign to encourage Americans to further patronize their butcher, perhpas by dropping prices to increase sales volume. We challenge the reader to itemize how this imaginary scenario is different from what we are enduring at the hands of veterinary medicine and veterinary medical education. Meanwhile the supply of veterinarians in America continues to increase. This graph (Fig. 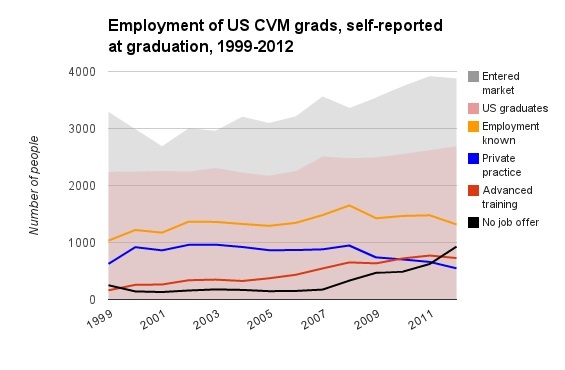 1) contains the best data available on veterinary new graduate employment. It is drawn from the data collected annually by AVMA surveying those students expected to graduate from US colleges of veterinary medicine. However, the dataset is seriously flawed- by a small sample size that has no proven correlation to the overall population, by a flat or dropping response rate and by both self-reporting bias and self-reporting error.17-21 This data, while useful for assessing trends, is insufficient for constructing effective interventions to alter those trends. One of the series' authors is Karl Wise, Ph.D., current AVMA Associate Executive Vice President and former Director of Information Management and of Membership and Field Services. He assured us almost a year ago that, "Your idea to survey veterinarians after the first year to gather compensation data is one of the goals"37 of the AVMA's data gathering efforts. Following a cohort over time to assess their economic welfare should not be a goal which has to be elucidated under public prodding by disgruntled, poorly served, former members. "CORE COMPETENCY: Serving as a science-based information resource for the veterinary medical profession and the public"
We submit that there is no area that ought to be more of a priority than that of our own profession. Without objective, timely, comprehensive and relevant information, prevet students cannot evaluate the soundness of a career in veterinary medicine. Without objective, timely, comprehensive and relevant information, admitted and graduating students cannot construct accurate budgets that enable them to stay afloat as they begin their careers. Without objective, timely, comprehensive and relevant information, those guiding the profession cannot know which direction to steer. To briefly reprise the gender shift, the brokerage reports roughly half the clients seeking to purchase practices in today's market are female, while half of those selling are female.d As far more than half of all graduates are female, and far fewer than half of all existing practice owners are female, the gender disparity in practice ownership appears to be growing. What implications does this growing imbalance have for the continuing impact of gender on the conduct of veterinary medicine? While practice succession is clearly occurring, we simply have no data on how the shifting gender composition of the profession may be affecting that. We don't even have a publicly available source of data on the rate of veterinary withdrawals from practice via death, retirement or other reasons. We don't know how many veterinarians leave practice every year, or have a calculation from real world data of how long the average veterinary career is so we could estimate that number with any confidence. Just as we don't know how gender may be affecting the rate of veterinarians leaving the workforce, we have no assessment of how the recession is affecting it. We don't know if or how many veterinarians have put off retirement recently. Anecdotally, some practitioners who sell their practices continue to provide service, creating competition their practice buyers were not expecting,e and some practitioners who would like to retire feel they cannot do so as their practices have lost so much value. The existing central documentation of practice sales data, VeterinaryMLS.com, remains poorly populated. To leverage the most information out of available data, this database of practice sales could be correlated with school collected demographic data transmitted via national licensing exam identification through state licensure databases to track the impact of such demographic factors as age, gender, race, school and background on the patterns of such transactions over time. In conclusion, we do not know how many veterinarians there are, where they came from, what they gave tangibly and intangibly to pursue the profession, what they do, how much they get paid, or where they are located. This is despite the fact that the data already exists. Without a system to generate such basic information through coordination of existing data, we cannot quantify or qualify the capacity to provide veterinary services. If we want to get out of the deep water we're in, and keep ourselves from getting everybody else into similar straits again in the future, the profession will invest in constructing such a system. (b) Givens, D. Personal telephone communication with Myers, E. 18 August 2012. Givens is the Interim Associate Dean of Academic Affairs at Auburn University's College of Veterinary Medicine. (e) Whitney, L. Personal communication via internet. Whitney recounted her own experience with a veterinarian attempting to breach the non-compete clause in their contract post-retirement. (4) Smith, A. Wealth of Nations. 1776. especially Book 1., Ch. 1, "Of the Division of Labour," for elaboration on this philosophy. (5) Brown, E. "Here we go again." Externs On The Hill. 16 September 2008. Web. Accessed: 1/13/2013. Available at: <http://www.externsonthehill.com/2008/09/here-we-go-again/> This blog identifies a meeting at the USDA to discuss the National Veterinary Medical Service Act's Veterinary Medicine Loan Repayment Program. Of specific note is the acknowledgement, "The purpose of the meeting was to open up a public forum to discuss how to define these underserved areas." (43) Multiple Authors. "NY Times article on vet med profession." Online posting. 23-24 February 2013. Web. Accessed 3/5/2013. Student Doctor Network. Available at: <http://forums.studentdoctor.net/showthread.php?t=986670&referrerid=385472> Of particular interest are posts #22 and #33, where students acknowledge considering alternatives to veterinary medicine because of the economic climate.